Kratz and Suter could easily be moved off the 40 man. Wilkerson too. However, I agree there are not too many players that need to be added. Only ones for sure, IMO, are Supak and Stokes. I could get on board with Olzak and even Derby to help fill out the pen rotation. In the end, I'll roll with the Supak and Olczak prediction only. Stokes is someone they need to protect, even if they have to DFA someone to do it. I am thinking that Stokes will either be protected or packaged in a trade prior to the draft. He is too talented to risk being exposed in the draft. Stokes has quite a bit of value as a second or third piece in a bigger trade. Someone earlier noted that Stokes to the A's might be a match... in a way, Stokes is arguably a Khris Davis who can play defense. The big difference: Stokes was drafted by the Brewers out of high school, and developed his power later in his professional career (years three and four). If anything, he is a legit OF bench option... and I like him over Taylor for his OBP skills. Stokes has managed to exceed my expectations. I had him pegged as a Brady Clark type, a 4th OF who could bring OBP skills, some speed, and doubles power. I didn't expect him to develop the power he has. #Brewers have added OF Troy Stokes Jr. and RHP Trey Supak to the 40-man roster, protecting them from Rule 5 eligibility, source tells The Athletic. Mark my words, I bet it will be Taylor, not Stokes, who is dealt. Interesting. I really thought a second pitcher would be added as well, assuming this is the full list. There are a fair number of guys who it wouldn’t be entirely shocking to see picked, but no one like Diaz who was nearly a lock. Would not be surprised if Stearns still adds another player, by the end of the day either within the organization or by trading for a 40 man guy from another team that would otherwise be DFA. Question? If they put Olczak on the 40 man roster, and then loved someone from another team they wanted to draft. Could they then drop a Jennings/Kratz/Saladino/Wilkerson to draft that player? Or if you are at 40 today, you can't draft anyone? So the Brewers AAA roster is at 30. 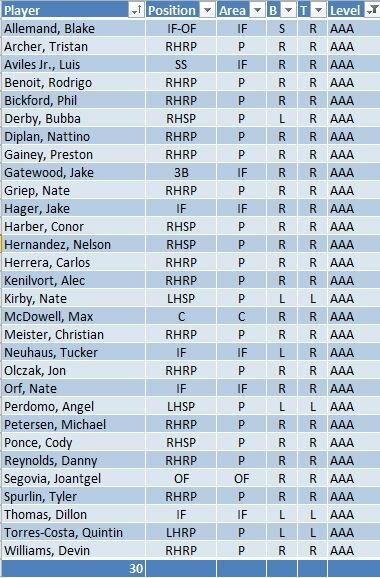 Per Cots, the AAA roster can have up to 38 players on it. What is the downside to filling up the roster further? I presume you need to have spots open in order to pick players in the AAA phase of the Rule 5, but 8 would seem to be excessive. I see no requirement that the players have to stay at the AAA level; the Brewers can reassign at will in the minors after the draft. Not that these are great prospects or anything, but a guy like Luna, Owenby, Ortega, or Kuntz could have value. It does not say too much about what the Brewers think of these guys. I believe it is rare that a player selected in the minor league phase of the draft turns out to be something but it can happen. Justin Bour in was selected by the Marlins from the AA Cubs roster and has had an impact in the major leagues. Owenby, who I had rated highly, seemed to have vanished. Ortega missed a lot of time with TJ, and 2019 is a bit of a "prove it" year for him. His control was still there, but he got hammered. I see the minor-league Rule 5 as a way to find some gems. The Crew had a lot of unsigned picks in the 2018 draft... this could help fill their minor-league rosters.